Gin Rummy is a scored card game, and as the name suggests, it’s derived from Rummy but is faster-paced and easier to score and finish than your standard Rummy. The game can be played with two-four players (usually played with two) and uses specific terms and a scoring system which don’t take long to learn. The objective of Gin Rummy is to be the first player to accumulate the predetermined number of points – for example, it may be the first player to reach 100 points (100 points works well for two players, while an increased total is better for three or four players. In order to win points, a player must either ‘Knock’ to announce an end to the game, or call ‘Gin’. Once this happens, that player will be awarded points for winning the game, as well as gaining points from the ‘deadwood’ cards left in all other opponents’ hands. 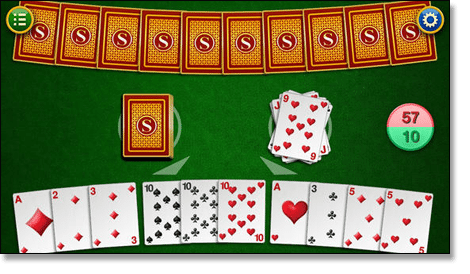 The following section explains all the important terms and their definitions in the game of Gin Rummy. Run/Sequence: This is when number or face cards run in a chronological sequence, where all cards are of the same suit – for example, a Three, Four and Five of Spades forms a run (the minimum number of cards to form a run/sequence is three). Set/Group: This is when you have more than one card of the same rank – for example, a pair of Threes, three Queens, etcetera (the minimum number of cards to form a set/group is three). Deadwood: The left over cards that don’t contribute to either a run or a set. Deadwood Points: The total value of the ‘deadwood’ cards. Knock: A ‘Knock’ in Gin Rummy ends the round – a player may only ‘Knock’ if he or she has ‘deadwood’ cards which amount to less then 10 points. ‘Knocking’ can be a risky game tactic, as there is always a chance the player whom ‘knocks’ may be undercut (see ‘undercut’). Undercut: Undercut refers to when a player who ‘knocks’ has more deadwood points than his or her opponent/s. Gin: Instead of ‘knocking’, a player can wait until he or she has a perfect Gin Rummy hand with no deadwood. To call ‘Gin’, a player must have a hand made up entirely of runs and/or sets. Note: While most Gin hands are made up of runs and/or sets via four, three and three card combinations, it is permitted to call Gin with a five and five card combination, a six and four card combination and a seven a three card combination. 1. Deal ten cards to each player with the cards face down. Place the rest of the stack of cards downward and turn over the first card; this upward card will start the discard pile. 2. On a player’s turn, he or she may either pick up a card from the downward stack, or the top card from the discard pile. You’re aiming to organise your hand into either ‘runs’ or ‘sets’ so there are no ‘deadwood’ cards. 3. Before the next player can take his or her turn, the player who picked up a card must also unload a card onto the discard pile. You can only have ten cards before the next person takes his/her turn. 4. Players continue to take turns (clockwise) until someone either chooses to ‘knock’ or call ‘Gin’. Once either of these happens, it’s time to take scores. Numbered cards = worth their value (a Three of Spades is worth three points). Knock scoring = the sum of the ‘deadwood’ cards in your opponents’ hands, minus the knocker’s own deadwood cards. For example, if the knocker has a ‘deadwood’ total of four points, and his/her opponent has a ‘deadwood’ total of nine points, the knocker gets five points. This only works if the knocker has fewer deadwood points than his or her opponent/s – if the knocker’s points are equal or higher to that of his/her opponent/s, the knocker’s score is undercut. Undercut = if a score is undercut, it’s the opponent with the lowest ‘deadwood’ total (obviously the other player if playing with only two) who gains the difference between his/her and each other players’ lots of deadwood points, plus an extra 25-point bonus. For ex., if playing with four players and Player A has a total of three deadwood points, the knocker (player B) has a total of four deadwood points, Player C has seven deadwood points and Player D has 11 deadwood points – then Player A is awarded one point (difference between A and B), plus four points (difference between A and C), plus eight points (different between A and D), plus the 25-point bonus, for a total of 38 points. Gin win = when someone calls ‘Gin’ he or she wins all opponents’ deadwood points, plus a 25-point bonus. Note: players can award a different bonus-point scheme, but must decide prior to starting how many points are allocated for winning hands (some players like to give a ‘Gin’ caller more bonus points). One player begins the round with 11 cards (rather than 10) and plays first by discarding a card as the first face up card. You can play two players v two players (teams). Rules differ if the downward pile becomes exhausted – some rules suggest no points are awarded and the round starts again, while others suggest whoever has the lowest deadwood total points gains the difference between his/her and each other players’ lots of deadwood points, but no bonus points. In Straight Gin, players must play until someone can call ‘Gin’. Knocking is not allowed. Where To Play Gin Rummy Online – If you want to play Gin Rummy online for free, we recommend you give BigFishGames.com RoyalGames.com a try. If you like Gin Rummy, you’ll be sure to like the endless poker and blackjack variations at reputable online casinos such as Royal Vegas Casino, G’day Casino, Jackpot City and BetOnline. These card games also use a combination of luck and skill, and require you to utilise strategy in order to better your hand. Try playing in one of the blackjack tournaments at Royal Vegas Casino if you want a competitive card game that sets you against a real live opponent. All of these sites allow you to safely play with real money which can be won and withdrawn (AUD currency).